Bishop Marion de Bresillac, the founder of the SMA missionaries, had died off the coast of Sierra Leone, and Fr. Augustin Planque had become the Superior of the SMA Fathers. 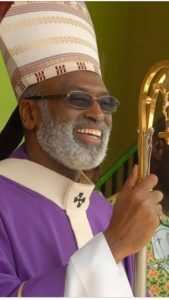 Thinking that Accra had a healthier climate, he had asked Propaganda Fide for permission to begin mission a post in Accra, as a “ sanatorium” for his priests working in Lagos and Ouidah. When, therefore, he heard of Fr. Gommenginger's recommendation of El-Mina , instead of Accra, for a mission post in his report, he decided in October 1878 to verify the suitability of El-Mina from Mr. Hamel, General Consul for Holland on the Gold Coast. When in 1879 a response came, it was written by Mr. Brun, a French man, a Papal Soave and an agent of a French trader, Bonnat, in Axim. He had traveled to El-Mina to start a store. Mr. Brun supported Fr. Gommenginger's choice of El-Mina, which still retained some Catholic traditions from the Portuguese times and still had a chief who was sympathetic to Catholic mission and was ready to donate land for farm. Besides, El-Mina, with a Catholic commanding officer, offered a ready protection in the event of an uprising. Fr. Planque was convinced by the response. Nine (9) years (1870-1879) had passed since Fr. Planque requested of the Propaganda Fide jurisdiction to enter the Gold Coast and to develop a sanatorium in Accra and to open missions in the Gold Coast. In the wake of Fr. Gommenginger's report, the Propaganda Fide decreed on April 28 1879 the erection of a Prefecture Apostolic of the Gold Coast , separating it from the vicariate of the two Guineas and entrusting it to the SMA Fathers. It extended from the river Volta to river Cavally in the Ivory Coast; and it embraced all the territory between the Vicariate Apostolic of Sierra Leone and the Vicariate apostolic of Benin. On 7 th May 1879, Pope Leo XIII approved of the Decree, confirmed it and ordered it published. On 27 th September, the Decree was published and the Prefecture Apostolic of the Gold Coast was official. Fr. Planque and the SMA Missionaries were put in charge. El-Mina was to serve as the central station. From there, it would spread; and the method was to be an intensive educational plan, for “a mission without schools is a mission without a future”. Rekindling a smoking Wick: The Mission of the SMA Missionaries in El-Mina. From the island of St. Helena, where they had been waiting, Fr. Planque sent Frs. Eugene Murat and Auguste Moreau as the firs SMA missionaries to the Gold Coast. They arrived at El-Mina on May 18 1880; and to meet them was Mr. Brun, who also helped them settle. Mr. Bonnat was their interpreter during their visits to the chiefs, elders, councilors, sub-chiefs and the people. To their surprise, they found in the home of some old worn statues . Alongside traces of devotion to St. Anthony, they also discovered that on certain Fridays, a group that called itself “ sancta mariafo ” would march through town and conclude with some rituals of theirs. There were also a practice, which seemed to imitate the sacrament of Baptism; for seven days after birth, the child would be presented with a crucifix and candle, and sprinkled thrice with water. Indeed, even some called themselves “Catholic” and considered it passed on by their ancestors. These were the smoldering vestiges of the Catholics faith from the Portuguese days, which the new SMA mission on the “ Mina ” coast hoped to rekindle into a flame for all of Gold Coast. Barely two month after their arrival in El-Mina, on 6 th August 1880, Fr. Murat died; and his burial was the first public liturgy that his companion, Fr. Moreau, celebrated on the Gold Coast. But, out of the death of Fr. Murat, a new life was born! On Christmas day 1880, a year-old mulatto child was baptized into the church by a visiting colleague, Fr. Boutry. It was the son of the British Acting Administrator at Cape Coast, CS. Salmon, and Esi Rhule. Fr. Moreau was his Godparent. “In baptism the child received the name of the patron of El-Mina's first Catholic church, built in 1482, and the name of the godfather. The child was called George August Salmon” (R. Wiltgen, Gold Coast Mission History …, 153). In 1881, at Christmas, five pupils of the school were baptized. These and others who followed to receive baptism became the first catechists ( lay apostles) , taking the faith beyond El-Mina and forming communities in preparation for the establishment of missions. One of these was Francis William Haizel Cobbinah, who was active in the evangelization of Cape Coast. Soon, some adults (parents of the pupils) followed their children to embrace the new faith. Interest in the school grew and the number of children seeking education increased. Fr. Moreau, however, believed that lasting results for their mission required that girls were also trained and instructed in the faith. “Religion, in order to put down solid roots must be practiced at home and prayers learnt at the mother's knee”. Accordingly, he arranged for the assistance of the Sisters of Our Lady of Apostles (OLA) , to educate the girls. With mission schools for boys and girls stared and well patronized in El-Mina Fr. Moreau began to look beyond El-Mina. He was thinking about mission in Axim and Kumasi. Following a visit of Prince Boakye Tsentsen, the father-in-law of the Asantehene to El-Mina, Fr. Moreau visited Kumasi with a harmonium gift for the Asantehene, Mensah-Bonsu. With the gift went a request to stay in Kumasi and start a mission and a church-school. The king could not accede to the request. He was destooled was not destined to survive Fr. Murat by much; for, following the lead of Mr. the following year. Back in El-Mina, Fr. Moreau traveled in a hammock to Axim, arriving there in October 1882. Axim had a small group of European Catholics, who introduced him to the chief. The chief welcomes the idea of a school and offered land for mission and school. News of the gift of land for mission and school thrilled SMA headquarters in Lyons. Fr. Moreau's companion, Fr. Michon, settled in Axim, making it the second residential station of the Gold Coast mission. They hoped that Axim would be the gateway for opening missions in the Nzema and Wassaw areas. The enthusiasm of the missionaries was not matched by financial support from Lyons and from the local population. Fr. Michon got sick and had to abandon the mission post on sick leave. Axim remained without priest until 1902, when Bishop Albert would re-open the station. Things had changed a little bit. There was a small local support; for, Mr. C. A. Rhule form Elmina had settled there and had formed a small Catholic community. Back in El-Mina again, Fr. Moreau identified a hill across the lagoon on which he could build a mission and a church-school. He christened it St. Joseph's hill, and set to work, with the help of the local population. They used material from the ruins of ancient Portuguese and Dutch fortresses, local timber and rocks from the coast. But, Fr. Moreau took ill and died on the boat back to Europe on March 26 1886. he was buried in the sea off the coast of Axim. He left behind El-Mina with 600 baptized faithful, schools for boys and girls, and Fr. Pellat and his team. On 27 th June 1887, the project was completed and the Fathers moved into the new mission house. The OLA Sisters had increased to five; and they still lived in the “Bridge House”. For them too, Fr. Pellat would also build a mission and schools on St. Joseph's hill. Up till now, classrooms had served for church and church had served for classrooms; but the people of El-Mina wanted a church. And so, again with local material and material from ruins of fortresses, and with Mr. Nelson mobilizing help for the project, the church was completed and roofed by Mr. Joseph Amissah. On December 29 th 1890, it was dedicated to St. Joseph for use. Using the best pupils in the school as catechists, Fr. Pellat began Catholic communities at Agona, Shama, Brenu Akyinimu and Cape Coast, where they taught catechism and prepared candidates for baptism.